In the early spring of 1847, several hundred pioneers of the Church of Jesus Christ of Latter-day Saints (Mormon) camped near here on their historic trek to the Valley of the Great Salt Lake. Driven from their homes in Illinois and Missouri, more than 3,000 of the oppressed people had wintered near the present site of Omaha, housed in log cabins, sod houses and dugouts, preparing for the journey to their new Zion in the Rocky Mountains. The first company of pioneers, led by Brigham Young, left Winter Quarters on April 14 with 143 men, three women and two children traveling in 73 wagons. They arrived in what is now Salt Lake City on July 24, 1847. Several other companies took the trail in the months and years that followed, traveling the same route, and many of them camping at or near this spot. Between 1855 and 1860 several thousand made the 1300-mile journey on foot, pulling their worldly possessions in handmade two-wheeled carts. The dramatic and oftentimes tragic story of these Handcart Pioneers is one of the epics of American history. Overpowered by summer heat or caught in the cold of prairie blizzards, hundreds of them lie buried in unmarked graves along the trail. 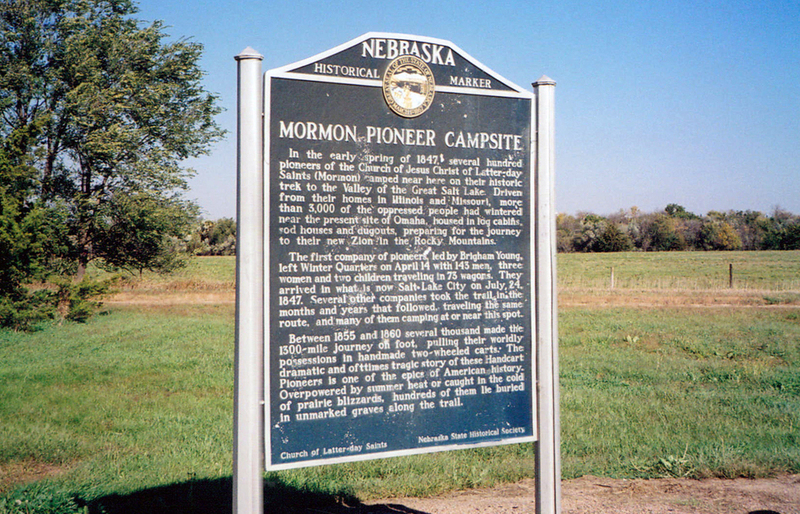 “Mormon Pioneer Campsite,” Explore Nebraska History, accessed April 19, 2019, https://mynehistory.com/items/show/368.